This magnificent yacht carries up to 85 guests. It is very comfortable and sails very flat on San Diego Bay. Nobody will get seasick. It is more stable than any normal motor yacht. In fact...we offer a "NO SEASICK GUARANTEE". Whether you or your guests are boating people, you will all be in awe of how wonderful this experience is. I can give you many testimonials of party groups and Brides who are happy to speak with you about their own wonderful experience. We accommodate beautiful weddings, very fancy parties, lavish fundraiser dinners, wine tasting events & much more. We conduct seasonal sunset sails and amazing Picnic's on the Ocean with the whales & dolphins. You can BYO catering & beverages or use our preferred caterers. Unlike most on-shore venues, halls, hotels, etc., We do NOT have additional charges for package upgrades, different linens, cake cutting, decore changes, corkage fees, etc. You customize our venue at your budget. We regularly have live music for weddings & parties. The atmosphere is amazing. The "America' is the most famous racing yacht in history. Not only famous but very beautiful, this 139 Ft schooner started the "America's Cup" yacht race, the most expensive yacht event in the world. There is no other yacht like this in the world. We want you to inspect the 'America' before you make your decisions. You will be convinced at first sight. 'America' is mostly available in San Diego but can also go to Los Angeles and even San Francisco when you want the "ultimate" yacht. 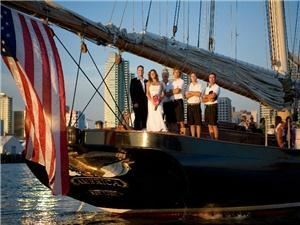 Atmosphere/Decor: Open spacious deck,varnished timbers, soft teak deck, polished brass, an amazingly shiney black hull, huge white masts and cream canvas sails that are an awesome backdrop for photos. Special Features: Place this yacht on the bay where guests want as a photo backdrop. 2 private cabins for Bride/Groom to prep, 6 showers/restrooms, salon, very large kitchen. This yacht is famous and is a 'once in a lifetime' opportunity for most to sail on her.